I have to admit… this is one of my favorite paintings, ever. It just flowed from me while I was in my little A-Frame cabin in Idaho. I had plans on the day I was working on this, to go up to Grand Targhee resort and have lunch, but I couldn’t pull myself away from this painting. I stayed at it until it was done. I really loved the whole process and I think this may have to become a large acrylic painting. Of course, the problem with that…. 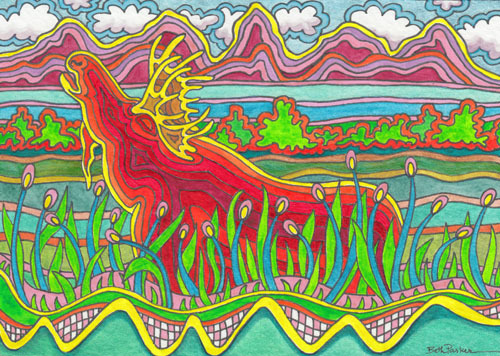 a moose painting is unlikely to sell in our local gallery, since it’s all about Oklahoma. No dang moose herds roaming around Oklahoma. The ancient Chinese philosopher Lao Tzu is believed to have lived in the 4th century B.C. Little is known about him, but it is likely that he wrote the Tao te Ching, the foundation of Taoist philosophy, and engaged Confucius in debate, honing both men’s belief systems. His name means either “old master” or the “old child,” and one legend says he was born with white hair after spending 80 years in his mother’s womb.